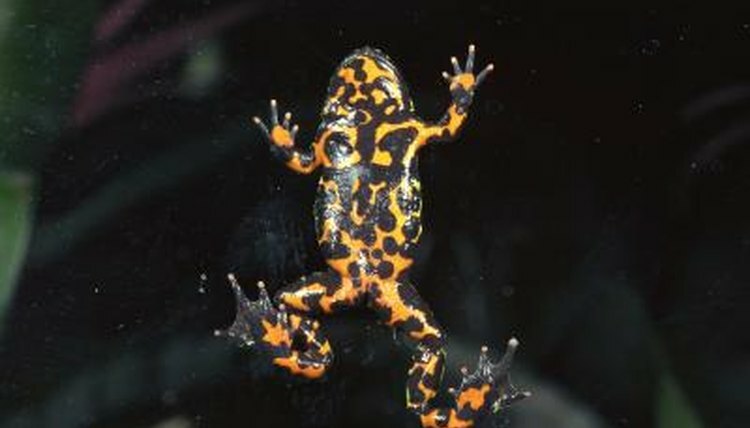 Fire-bellied toads are semi-aquatic and require an enclosure that has both land and water. You want at least a third to a half of the aquarium to be land, with the remainder being aquatic space. In order to be able to provide your toads with both habitats in one tank, you'll need to use at least a 10-gallon aquarium for up to 3 toads, which will provide enough space for the necessary environments. A basic fire-bellied toad setup can be as simple as coconut coir bedding covering the floor of the tank with an extra-large bowl for water. To provide a larger water area, you can use large, smooth rocks as a thin layer on the bottom of the tank, building up a portion of rocks that will stand above the water. You will need to add caves and fake plants above and below water for hiding places. If you want to create a more natural enclosure, use coconut coir or peat moss for the land substrate, and create a wall using a divider to separate the water and land. Either purchase an aquarium divider at your local pet store or make a divider with a piece of plexiglass. Silicone the divider, at a slant, to the aquarium walls. Fill part of the enclosure with stones and substrate and the other part with water. If you make your own divider, consider using an acrylic-based glue to attach stones to provide your toads with a better grip when climbing out of the water and onto the land. Live plants create a more natural enclosure and provide hiding places and mental stimulation for your fire-bellied toads. Floating plants, such as water lettuce and crystalwort, can be added to the water; they create a place for your toads to sit and roots for them to swim through. Umbrella plants, rubber plants and pothos are also safe plants that you can add to a fire-bellied toad enclosure. You can buy live plants for the toad habitat at most plant nurseries. The most important aspect of housing a fire-bellied toad is to keep the habitat clean. Toads absorb everything through their skin, so no matter how you set up the enclosure, you want to keep it clean so your toads will live their full lives with a clean bill of health. If you're using a large aquarium or have created a naturalistic setup, you should consider using a filter to help keep the water clean in between partial water changes. How Long Can Newts Stay Out of Water?